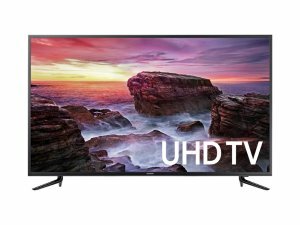 Kohl's offers the Samsung UN58MU6100FXZA 58" MU6100 4K UHD Smart TV for $549.99. Features: The Samsung MU6100 Ultra HDTV redefines the viewing experience by producing a colorful High Dynamic Range (HDR) picture. Our new Smart TV user-interface (UI), faster running streaming services with Quad Core Processing, and mobile to TV screen mirroring make enjoying personal pictures and videos a cinch.